I hope you wake up today with a lot of excitement and vigor and hope for this new day. There is it right in front of you. A brand new opportunity to do amazing and extraordinary things with your life. When you come to the crossroads of your life and face the winner or quitter in you. Listen to the winner inside of your head. This day, this week, this time pick the winner. The quitter will not take you down the road you want to go. Don’t live the average every day life. Don’t give up. Don’t listen to the average. Believe in yourself when no one else does and go for the gold! Today I say be true to yourself. Just be you. Everyone else is already taken up. You have an important role to play in this world. So get out there and do what you are supposed to be doing. And while you are doing that make sure and get your steps in for the day and for the week and get ready to be a relentless dominator. You are important in this world so keep on stepping and don’t ever give up on yourself or other people. Because in a very short amount of time people can change their life around and do big and awesome and positive things with it. Go for the gold and good luck today. I love Mondays, don’t you? 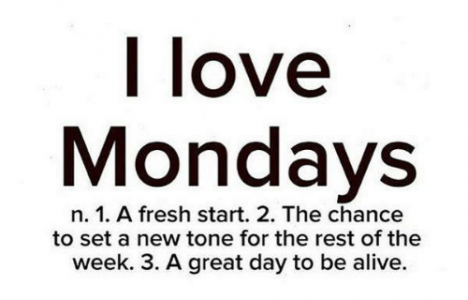 Every Monday you get a new start to your week. Every Monday you get to hit the reset button on your life, your hopes, your dreams, your fitness, your work and your steps! How cool is that? And this Monday is even cooler because it is the first Monday in May! It is the first Monday of a new month of a new you of a new habit in your life of being awesome and of your winning attitude. At the beginning of this month of May I encourage you to think about your life. Are you where you want to be? Are you moving forward in your life? If so, great! If not do something today to get closer to your dreams or to be more alive. This Monday go for it. Give it your all. Invest in yourself and your mind and your fitness and your body. Live like there is no tomorrow because it is a crazy world out there. Have fun!